When your ship pulls into port in Naples, take a private shore excursion to the Amalfi Coast, with plenty of photo stops along the way. Visit two or three charming towns that may include Sorrento, Positano, Ravello or Amalfi. This full-day tour with a personal guide lets you set the pace and customize your itinerary. Round-trip port transport by private vehicle is included. Excellent shore excursion. Our driver, Diego, was a great tour guide, allowing us to stop for pictures whenever asked, and spend as much time as needed in each location. 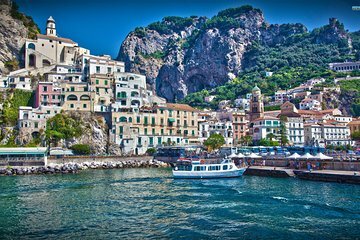 I highly recommend Viator and the Amalfi Coast private shore excursion. Our driver was amazing! He was waiting for the 6 of us as we left the ship. Shortly after entering the car he asked us if there was anything in particular that we wanted to see or do so that he would be sure to satisfy all of our wants and desires. He took us to all the sights and even arranged our lunch at a restaurant on top of the cliff overlooking the sea. We ate the most amazing pizza overlooking breathless views. We also had by far, the most amazing Sfogliatelle we have EVER had! We ate fresh picked cherries from a vendor at one stop and frozen ice at another. What an Amazing tour!! One we will never forget!! Our only regret was that we didn't get the driver's information. My wife and I are planning a longer visit soon to the Amalfi Coast and would have loved to use him again! This trip was amazing ! Aronn our driver was the best. His knowledge of the area was impressive plus he was a lot of fun. Great day and perfect last day of our cruise.